It’s a cliché question that psychologists do often ask in the therapy room, and it is asked for a good reason because successfully processing and managing emotions is very important for mental health. For some people though, it’s a question they find almost impossible to answer. These are people with high levels of the trait alexithymia. The term alexithymia comes from the Greek, a = lack, lexis = word, thymos = mood/emotion. It was first coined by psychiatrist Peter Sifneos in the 1970s to describe the presentation of some of his patients who often had substantial difficulty verbalizing how they were feeling. Today, modern researchers conceptualise alexithymia as a multidimensional construct, comprised of at least three interrelated components: difficulty identifying one’s own feelings (DIF), difficulty describing feelings (DDF), and an externally-orientated thinking style (EOT) whereby one tends to not focus their attention on their emotions. In other words, people with high levels of alexithymia rarely pay attention to their emotional states (EOT) and have difficulty accurately appraising (DIF, DDF) what those states are. We all have some level of alexithymia. The trait is normally distributed in the general population, meaning that most people are ok at processing their emotions, and then there are some people at the extreme ends of the distribution who are either fantastic at it or very bad at it. These individual differences in alexithymia reflect, in part, the developmental level of people’s emotion schemas. Emotion schemas are the cognitive structures we all use to process information about emotions. Through our life experiences, our schemas can gradually develop and become more complex and organised, which allows us to interpret and understand information about emotions at a deeper and more nuanced level (i.e., knowing that we are specifically feeling sad and not angry, rather than just knowing that we are feeling bad in a very general and undifferentiated sense). High alexithymia can, therefore, be due to having poorly-developed emotion schemas. Additionally, people’s levels of alexithymia can fluctuate and increase when they are going through periods of distress, and these individual differences in alexithymia reflect the extent to which people are using experiential avoidance of emotions as an emotion regulation strategy (i.e., trying to cope with emotions by avoiding focusing on them). Why is alexithymia important to psychologists? Alexithymia is important to psychologists for two key reasons. The first is that if a patient has high alexithymia, this can reduce the effectiveness of mental health treatments if this is not properly accounted for. Many of our therapy techniques take for granted that patients already know how they are feeling and can communicate this accurately to others. For patients with high alexithymia though, these fundamental emotional awareness skills first need to be taught if the other aspects of therapy that rely on these skills are going to be as effective. The second reason is that alexithymia appears to be a key risk factor for the development and maintenance of a range of mental disorders, including depressive, anxiety, personality, eating, and substance use disorders. One hypothesis behind this relationship is that alexithymia limits people’s ability to regulate their emotions. That is if people don’t know exactly how they are feeling, their ability to subsequently pick appropriate strategies to manage those feelings is impaired. This means that when difficult life events occur, people with high alexithymia typically have a harder time coping, so are more predisposed to various mental disorders. Targeting and improving alexithymia in therapy can, therefore, be helpful in addressing mental health symptoms. How do we measure alexithymia? Because alexithymia is important for mental health, psychologists need to assess it in clinical and research settings. Until recently though, there were few comprehensive measures available to do this. To try to fill this gap, our research group recently published a new self-report questionnaire called the Perth Alexithymia Questionnaire (PAQ). Prior to the PAQ, arguably the most comprehensive (and most widely used) alexithymia measure was the 20-item Toronto Alexithymia Scale (TAS-20). The TAS-20 is a self-report questionnaire that was developed in 1994 to provide separate DIF, DDF, and EOT subscale scores, as well as an overall composite score as an overall marker of alexithymia. Most of what researchers know about alexithymia comes from decades of work using the TAS-20, so it has been a tremendously helpful tool. However, it’s now quite old, and recent studies have highlighted that the reliability of its EOT subscale is too low for that subscale score to be used, and the reliability of the TAS-20’s overall composite score is also below what is ideally desired for clinical use (reliability refers to the consistency of a measure, or how much error there is in its scores; statistically speaking, reliability coefficients of at least .70 are needed for a measure to be useful in research, and higher coefficients of around .90 are desirable if a measure is used to inform important clinical decisions). These weaknesses have consequently restricted the utility of the TAS-20 and have meant that it has been particularly difficult to learn about EOT. Furthermore, the TAS-20 was not designed to provide any valence-specific scores; that is, separate information about people’s ability to process negative (e.g., sadness) versus positive (e.g., happiness) emotions. 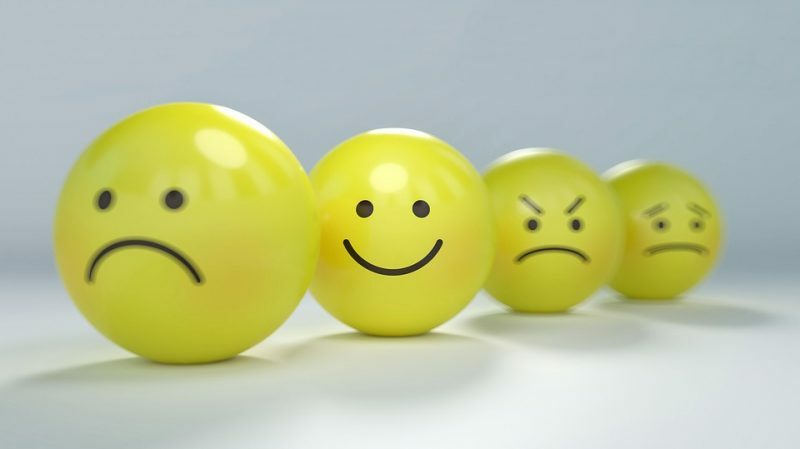 Recent neuroimaging and laboratory-based research have suggested that people’s ability to process their negative emotions is not necessarily equivalent to their ability to process their positive emotions. Hence, the absence of valence-specific information in the TAS-20 is limiting. Our intention with the PAQ was, therefore, to try to develop a modern, optimized measure, with its content and structure guided by the many advancements in alexithymia knowledge that have emerged since the TAS-20 was introduced over two decades ago. We also wanted our new measure to be quick to administer and easily accessible online for researchers and clinicians. Negative-Difficulty identifying feelings (N-DIF; e.g., “When I’m feeling bad, I can’t tell whether I’m sad, angry, or scared”). Positive-Difficulty identifying feelings (P-DIF; e.g., “When I’m feeling good, I get confused about what emotion it is”). Negative-Difficulty describing feelings (N-DDF; e.g., “When something bad happens, it’s hard for me to put into words how I’m feeling”). Positive-Difficulty describing feelings (P-DDF; e.g., “When I’m feeling good, I can’t talk about those feelings in much depth or detail”). General-Externally orientated thinking (G-EOT; e.g., “I prefer to just let my feelings happen in the background, rather than focus on them”). All the PAQ items are answered on a 7-point scale (ranging from 1, “strongly disagree,” to 7, “strongly agree”), with higher scores indicating higher levels of alexithymia. These five subscales can also be combined into several composite scores, including summing all subscales into an ALEXI composite score as an overall marker of alexithymia. In our 2018 study introducing the PAQ, we tested its validity and reliability in two large adult samples and found it to function excellently. All PAQ items clustered together well into their intended subscale groupings when subjected to factor analysis (a statistical technique that tests whether items are measuring a common underlying construct). These five subscales were significantly positively correlated, thus supporting that they were measuring separable parts of a coherent alexithymia construct. All subscale and composite scores also had high reliability coefficients, successfully reaching the reliability thresholds desired for research and clinical use. The clinical relevance of the PAQ was supported by an expected pattern of correlations with other measures. High alexithymia scores were significantly associated with higher levels of depression and anxiety symptoms, and more emotion regulation difficulties. Our analyses also further demonstrated that it was important to distinguish between negatively and positively valenced emotions when measuring DIF and DDF. People in both samples, on average, reported significantly more difficulties appraising their negative feelings, as compared to their positive feelings. Indeed, we expected to see these valence-specific differences, because people often consider their negative emotions to be undesirable, so they may be more likely to use experiential avoidance to try to cope with negative emotions. On present evidence, the PAQ is, therefore, a promising new assessment tool. We think its capacity to reliably measure all components of alexithymia and do so in a valence-specific manner should help to enable more comprehensive assessments of this important mental health construct moving forward. These findings are described in the article titled The psychometric assessment of alexithymia: Development and validation of the Perth Alexithymia Questionnaire, recently published in the journal Personality and Individual Differences. This work was conducted by a team including David Preece from Edith Cowan University and Rodrigo Becerra from the University of Western Australia. David Preece is a researcher at the Edith Cowan University · School of Psychology and Social Science. "My research interests are in emotions, psychological assessment, and the understanding and treatment of psychopathology. One of my main goals right now is to develop new, freely available measures, that can be used to assess a range of emotional constructs in clinical, organisational, and research settings." Rodrigo Becerra is a Philosophy PhD and Associate Professor at the University of Western Australia | UWA · School of Psychological Science.